25mm. P.P. 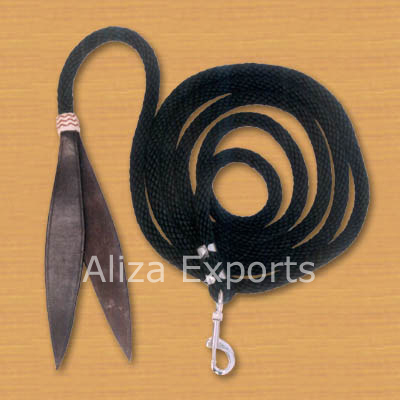 tape lead with heavy chain & snap hook decorated with various decorative tapes. 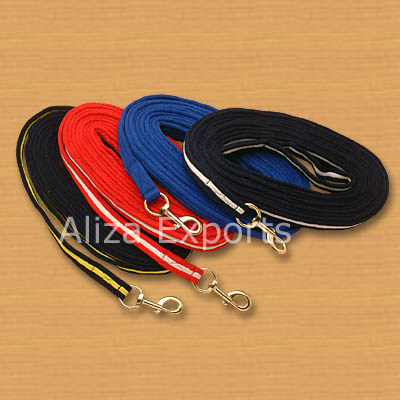 Ideal for use as matching leads with halters Colors: Available in single, multi & combination colors as per requirement. Acrylic soft lead in single and multi-colour combination with big eye snap hook. 2 mtrs in length. 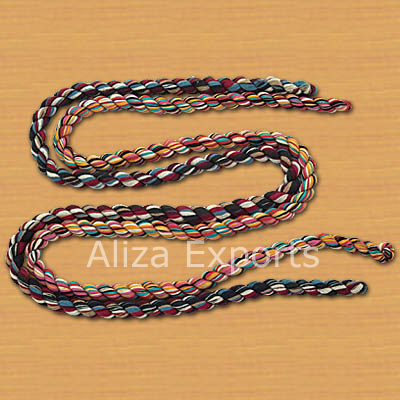 Colors: Available in single, multi & combination colors as per requirement. P.P. 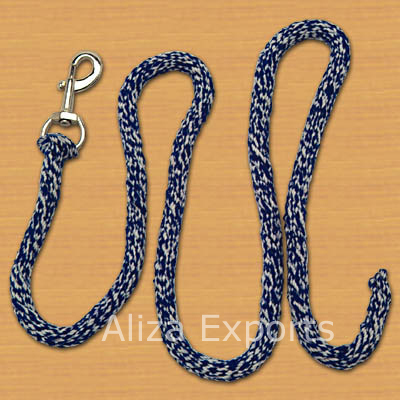 semi solid hand knitted lunging lead, 17mm with loop in the front in which either a panic hook or a snap hook can be used or replaced. 24 inches in length. Colors: Available in single, multi & combination colors as per requirement. P.P. 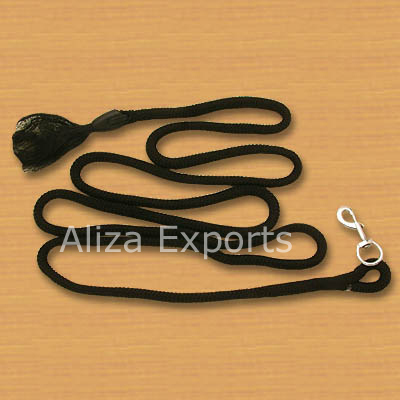 semi solid hand knitted lunging lead, 17mm with hair on the tail, with loop in the front in which either a panic hook or a snap hook can be used or replaced. 24 inches in length. 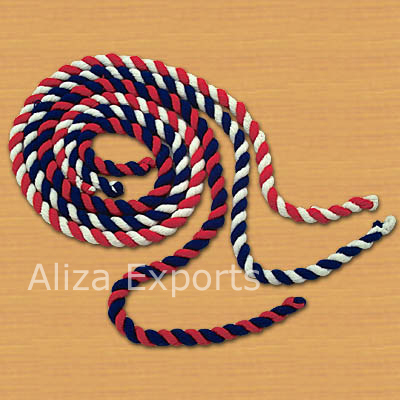 Colors: Available in single, multi & combination colors as per requirement. 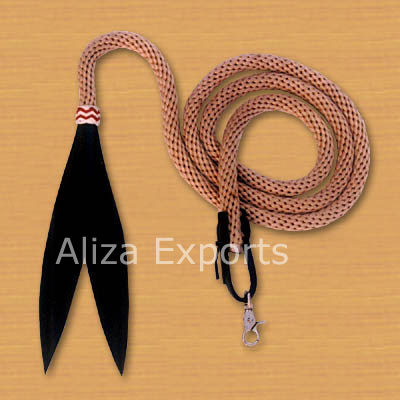 Cotton lunging lead, 8 ft to 24 ft length 2 ply with snap hook/ panic hook. 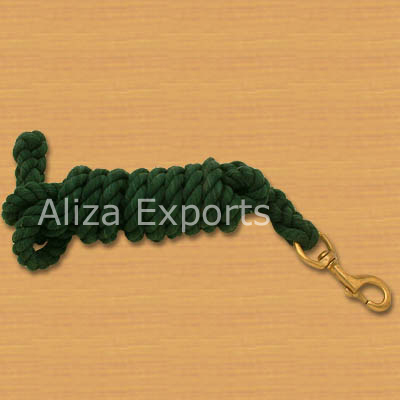 Colors: Available in single, multi & combination colors as per requirement. 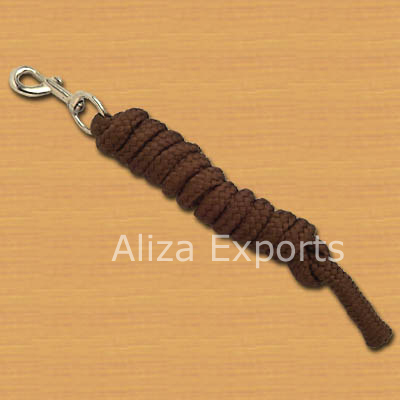 Cotton 2 ply rope, 2 mtrs in length comes with snap/ panic hook. 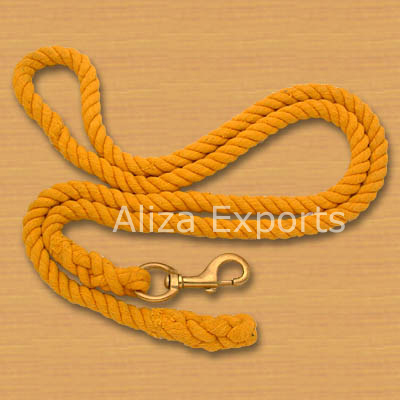 Colors: Available in single, multi & combination colors as per requirement. 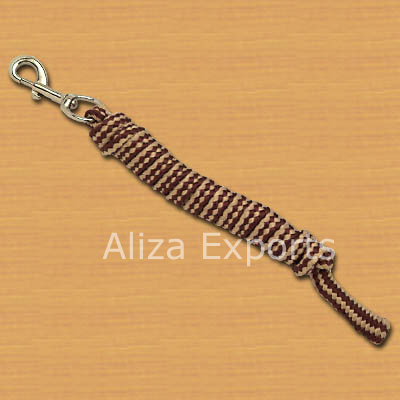 Single or multi-colour 25 mm soft cushion girth with big eye snap hook. Comes in 8 inches and 24 inches length. Colors: Available in single, multi & combination colors as per requirement. 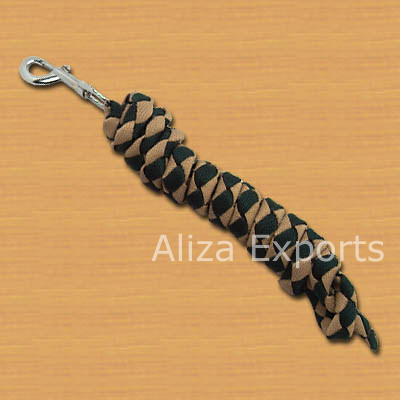 New soft cotton rope with 2 mt length & carpet weave with big eye snap hook. Available in variety of colours. Colors: Available in single, multi & combination colors as per requirement. Very Strong 2 mt to 2.5 mt length P.P. strap rope with snap or panic hook. Colors: Available in single, multi & combination colors as per requirement. 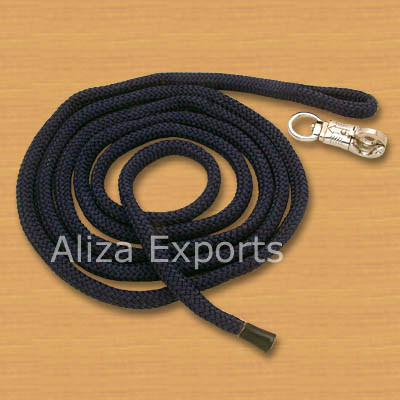 Soft Acrylic 2 mt to 2.5 mt length Lead Rope with snap or panic hook. Colors: Available in single, multi & combination colors as per requirement. 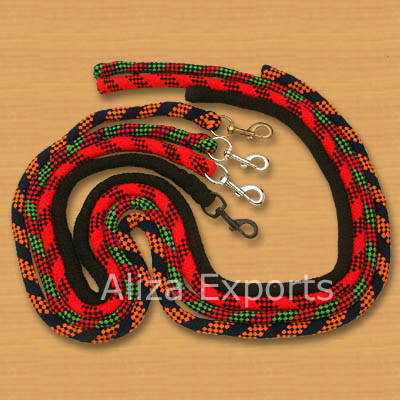 2 mt to 2.5 mt length Two ply & Three ply Colour fast cotton rope with snap or panic hook. Colors: Available in single, multi & combination colors as per requirement. P.P. solid lead with leather tail and big eye snap hook. 12 feetlength. 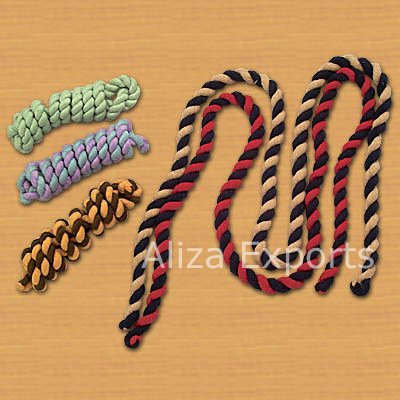 Colors: Available in single, multi & combination colors as per requirement.